With over a decade of online experience, All Jackpots Casino knows what real-money gamers want and provides them with over 500 online casino game titles on a downloadable, no download, and mobile casino platforms. The casino is powered by Microgaming – the industry’s leading software provider, which means not only the latest and the most innovative online casino games, but also a direct connection with the best Progressive Jackpot Network. 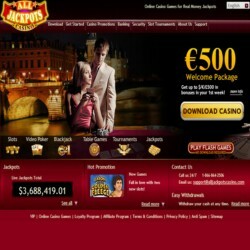 All three casino platforms at All Jackpots Casino are powered by Microgaming software. Over 500 highly interesting games include the latest creations, as well as classic slots and table games. The no download platform allows quick and easy access to somewhat lesser amount of games. The mobile casino features just over 20 titles and is compatible with most current mobile devices. There are over 40 variations of blackjack available to All Jackpots Casino members. Single-hand, multi-hand, single-deck, multi-deck, you name it! On top of classic blackjack games there are such titles as Vegas Downtown Blackjack, Atlantic City Blackjack, Double Exposure Blackjack, High Streak Blackjack, Hi Lo 13 Blackjack, and many more. Mobile casino players also have access to several titles whenever and wherever the mood to gambling strikes them. 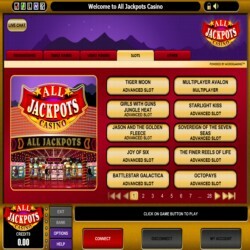 With over 500 games in the library, All Jackpots Casino host everything an online gamer can dream of. Online slots are found in abundance and start with the old favorites, 3-reel machines, and go all the way to the latest innovations featuring 1024 paylines. Classic table games, video poker, instant games, keno, specialty games, and more are waiting 24/7 to provide members with high-class casino entertainment. Mobile players have up to 24 games to choose from depending on the platforms. The mix of slots, table games, and scratch cards is always at their disposal. All Jackpots Casino knows that bonuses are important to players. The casino welcomes every players with a $500 welcome bundle during their first week at the casino. First there’s a 100% Max. $200 bonus + 25 Free Spins, then there are 25% Max. $100 2nd deposit, 50% Max. $100 3rd deposit, and 25% Max. $100 4th deposit bonuses. Another great way to collect bonuses at All Jackpots Casino is the annual cash back bonus offering 10% cash backs every month, up to $5,000 per year. Other promotions are held regularly, on top of various competitions, giveaways, and one of the best loyalty programs in the industry, where collected points can be exchanged into cash. All Jackpots Casino combines over 500 online casino games from Microgaming on three platforms: downloadable, no download, and mobile casino. A long list of progressive jackpots from Microgaming Progressive Jackpot Network is complemented by regular online casino tournaments. Hefty welcome package is available to all new members, as well as regularly updated promotions, competitions, and a highly rewarding loyalty program.